We hebben hier al eerder gewezen op de extreme denkbeelden van veel van de organisatoren van de "Free Gaza" Vloot. Hieruit blijkt wederom dat dit geen vredesactivisten zijn maar sympathisanten van Hamas en strijders tegen Israel. Het is jammer en diep triest dat goedbedoelende mensen in hun propaganda trappen en ook aan hun acties deelnemen. Overigens verliep een en ander probleemloos op de kleinere schepen en alleen op het Turkse schip, geleid door het extremistische IHH, kwam het tot hevige gevechten met tientallen doden en gewonden tot gevolg. Alles wijst erop dat dit vanuit de IHH was gepland, en dat men op deze manier wil proberen de druk op Israel om de (gedeeltelijke) blokkade op te heffen, wil vergroten. Het feit dat er zelfs een achttien maanden oude baby aan boord was gebracht als menselijk schild, spreekt boekdelen. "[Remember] Khaibar, Khaibar, oh Jews! The army of Muhammad will return!" Khaibar is the name of the last Jewish village defeated by Muhammad's army in 628. Many Jews were killed in that battle, which marked the end of Jewish presence in Arabia. There are Muslims who see that as a precursor for future wars against Jews. 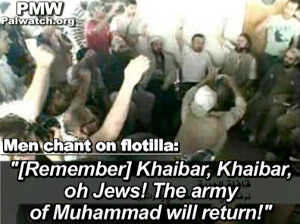 At gatherings and rallies of extremists, this chant is often heard as a threat to Jews to expect to be defeated and killed again by Muslims. Al-Jazeera also interviewed a woman who said that the flotilla participants' goal was "one of two happy endings: either Martyrdom or reaching Gaza." Reporter: "Despite the Israeli threats and several unexpected delays, the arrival of the ships at the meeting point before sailing to the Gaza Strip inflamed the emotions and the enthusiasm of the participants." Reporter: "While singing songs reminiscent of the Palestinian Intifada (Palestinian terror war against Israel, 2000 - 2005), participants expressed their longing to reach Gaza." Hamas's Al-Aqsa TV chose to glorify flotilla participants who shouted the Islamic battle cry by broadcasting an interview with a university lecturer who referred to them as "those with faith and will." "Yesterday I followed the news agencies and they conveyed Zionist threats to stop the convoy and prevent it from entering Gaza; on the other side, those with faith and will once again call out upon hearing the reports of the threats: '[Remember] Khaibar, Khaibar, oh Jews! The army of Muhammad will return!'" Hamas TV Host: "Strong motivation." Shayyeq Naaman: "One woman standing on the ship said that now we are awaiting one of two happy endings: either Martyrdom or the beaches of Gaza." Al-Jazeera also reports that before the confrontation, flotilla participants announced that they would use "resistance" against Israel. Mukawama (resistance) is the Arabic term used by Palestinians to refer to all violence against Israel, including suicide terror. "The flotilla includes hundreds of Arab and foreign solidarity activists from more than 40 countries ... They have announced their determination to use resistance to any attempt at piracy by the Israeli occupation."